Lasagna is one of those things everybody should know how to make. Too complicated you say? Nope, not anymore! You can totally make this! Pair it with a loaf of crusty bread (recipe here! ), a green salad, and a bottle of wine, and you have an instant romantic Italian dinner. Valentine’s Day is very soon, you know, and whether you have a special somebody to cook for or not, YOU are a special somebody, and gosh darn it you deserve a fancy dinner. 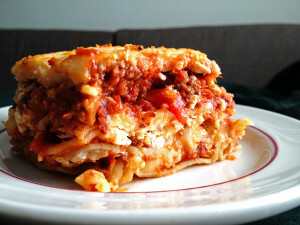 The key is to get oven-ready lasagna noodles that don’t have to be cooked before layering everything in the baking dish. You can cross “struggling with hot pasta” off your to-do list. Well, unless you want to do that. I don’t recommend it though. This can be made in any baking dish – a 9″x13″ is traditional but a square brownie pan or round/oval dutch oven work just as well. It doesn’t even need a lid. This comes out a bit like the frozen kind I enjoyed as a kid, but of course with fewer preservatives and much lower sodium. It’s easy to tweak the recipe too – add extra veggies to the sauce before simmering such as spinach, kale, zucchini, anything you like. For slower cooking veggies like carrots or mushrooms, cook them before adding them to the sauce. See that golden goodness on top? That’s melted cheeeeeeese. Yeah you know you want this for dinner. It makes excellent leftovers too. In a large skillet or saucepan, heat the oil on medium then add the diced onions. Cook for 5-10 minutes or until they start getting translucent. Pour onions into a separate dish while the meat cooks (so they don't burn). In the same skillet, add ground beef and break up into little pieces. Cook until browned, stirring occasionally. Add onions back to the hamburger. Pour in the entire jar of spaghetti sauce. Simmer for 10-20 minutes. 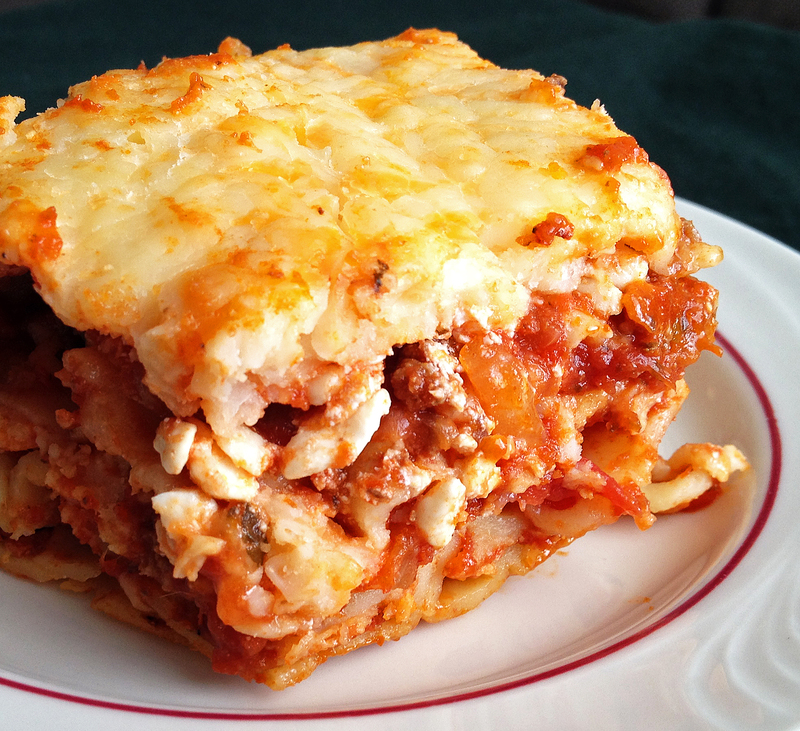 Layer the following in the baking pan: a single layer of uncooked noodles, 1/3 of the sauce, 1/3 of the cottage cheese, 1/3 of the mozzarella. Repeat two more times, ending with mozzarella on the top. For each layer just spread the stuff out as best you can, no need to be perfectly even. Bake for 45 minutes in the preheated oven, and let cool for 10 minutes before serving to keep the meat nice and juicy. This entry was posted in Dinners and tagged beginner-friendly, dutch oven, ground beef, Italian, pasta.